Rose Anne (known as Rosa during her nursing career), was born in Lurgan, Co. Armagh on August 10th 18861. Following a period as a book keeper she trained as a nurse at the Mater Infirmorum, Belfast, between January 1909 and January 19131. She than trained as a District Nurse at St Lawrence’s House, Dublin, which was the training institution for Catholic nurses at that time1. She enlisted into the Queen Alexandra’s Imperial Nursing Service (Reserve) in June 19152, as a Staff Nurse. Nurse McGibbon embarked on the Aquitania for Suez, leaving Southampton on the 9th November 1915 and arrived in Egypt on the 27th November. In Egypt she joined 18 Stationary Hospital. In November 2016 she joined 21 General Hospital in Alexandria, and in December 2017 she was appointed an Acting Sister. In June 1918 she was admitted to 19 General Hospital and had an appendicectomy. She appeared to recover but then became very unwell and was readmitted. 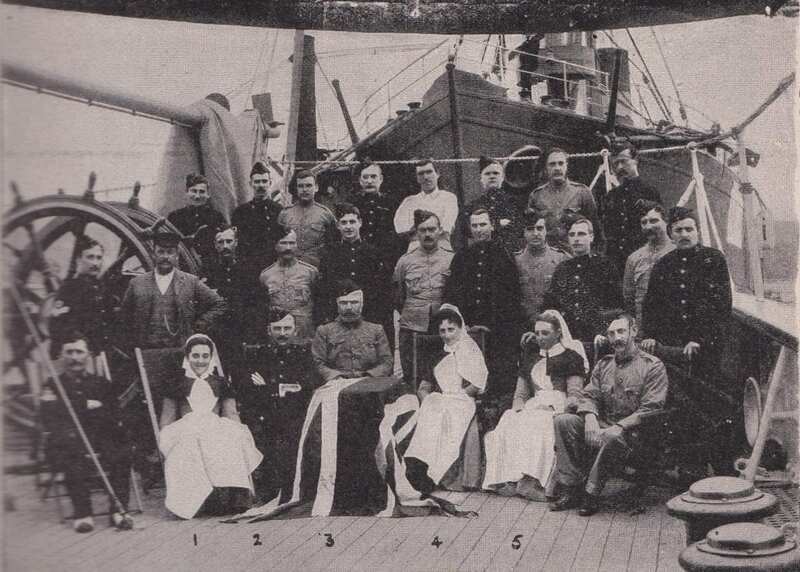 After investigations she was invalided back to the UK on the Hospital Ship Wandilla. She was sent home on sick leave, and died at home on 6th March 19192. Mary Ellen DAVIS was born in Dublin in 1878. Her father was a Clerk in the Civil Service. She was educated at a private school in Dublin1. From February 1901 to November 1902 she trained as a nurse at the City of Dublin Nursing Institution1, which was associated with the City of Dublin Hospital2. After qualifying as a nurse she worked as a Ward Sister at the Infection Hospital, Skipton, Yorkshire1, which was part of the Skipton Union Workhouse3. From 1905 to 1909 she worked at the Royal Free Hospital in London, and in 1909 she applied to join Queen Alexandra’s Imperial Military Nursing Service (QAIMNS)1. She was posted to the British Expeditionary Force on the 8th August 19141. Her initial posting was to the Isolation Hospital at Le Havre. She is mentioned in Staff Nurse Lilian Robinson’s diary, sharing a berth as they crossed to France on the SS Comrie Castle. She was ‘Mentioned in Dispatches’ in June 19151, and then followed postings to 7 General Hospital, 2 Stationary Hospital, and 12 Stationary Hospital. She was ‘Mentioned in Dispatches’ again on the 4th January 19171 6. Promoted to Sister 18th May 19171, she then served at 26 General Hospital. On the 3rd June 1918 she was awarded the Royal Red Cross (Associate)7. In the summer of 1918, German air raids on Allied bases increased in both frequency and severity. 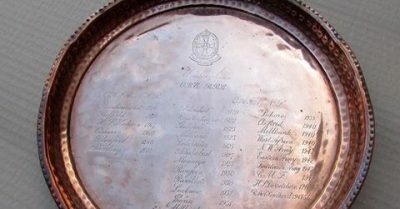 The worst of these, as far as the nursing services were concerned, took place on 19 May at Staples, 29 May at Doullens, and 31 May – again at Staples. In fact the Étaples nurses were having a particularly rough time. The raid on the 19th lasted three hours and caused damage to several hospitals. Maud McCarthy reported that, ‘at No. 1 Canadian General Hospital, 1 sister was killed, and 2 so severely wounded that they died shortly after, and 5 were also wounded. 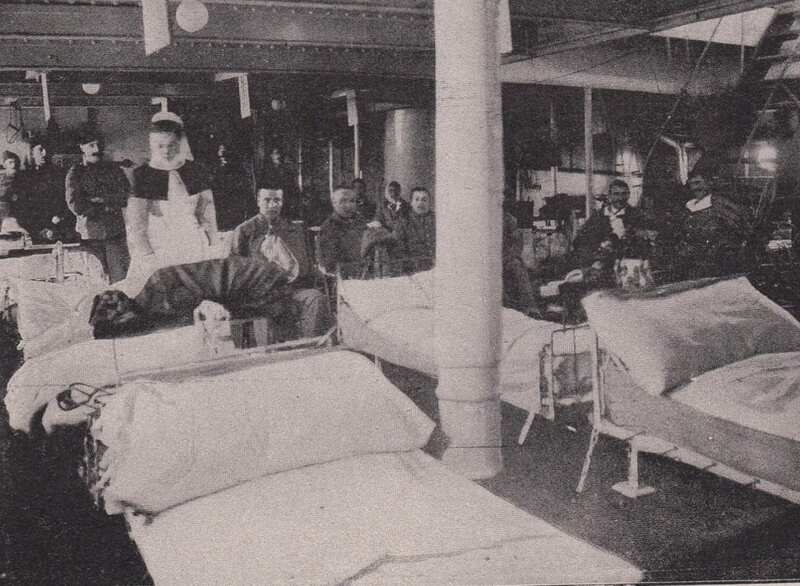 At 26 General Hospital there were 2 minor casualties amongst the Nursing Staff, and their quarters were partly wrecked …8. For gallantry and devotion to duty during an enemy air raid. When the Sisters’ quarters were wrecked and bombs were falling, she showed a fine example and assisted materially in controlling the situation and attending to the Sisters who were wounded. 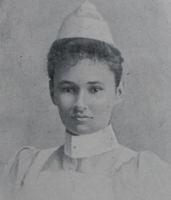 During 1919 she also served at 57 General Hospital and at 3 General Hospital1. She was posted as Acting Matron to the Rhine on the 15th April 19191. She served as a Sister for another 7 years with postings at the Queen Alexandra Military Hospital London, the Cambridge Military Hospital Aldershot, Egypt, Shorncliffe and Hong Kong1. In 1930 she retuned to the Cambridge Military Hospital as a Sister but including Matron’s duties. In 1931 she went as Matron to Litchfield. At a promotion board in 1932 she was considered not qualified for promotion to Matron. She resigned from the service on the 15th March 1933 after 22 years service, and went to live in Johannesburg, South Africa where she died on the 15th August 19331. Florence May CURRIER was born in St Georges, Wellington in Shropshire, 14 May 18891 2 3. Her father was an Engineer’s Clerk1. By the 1911 Census she was employed as a domestic servant near to home2. She trained as a nurse at the Oldham Royal Infirmary may 1913 – May 1916, and was employed there before volunteering for service with the Queen Alexandra’s Imperial Military Nursing Service (Reserve)3. Staff Nurse F. Currier Q.A.I.M.N.S.R. has worked at this hospital for one year and six months. She is kind and willing but lacks experience in ward management and needs to work under supervision3. S/N Currier has served in this hospital since 12.9.18 as S/Nurse Medical Section and Night Duty. Her professional ability is up to the average. Administrative capacity good. Temper good. Tact and judgement good. Energetic, reliable and punctual in all her duties. S/N Currier has not done any charge duty since coming to France. With experience she will make a good Sister3. She was demobilised in July 19193. Whilst she was in Le Havre, Sir John Lavery painted a picture of her along with a VAD. This picture is in the Imperial War Museum – “Le Havre, 1919: Nurse Billam and Sister Currier” (wrongly titled as Sister Currier)4. Mrs Theodosia Agnes COBBOLD (neé Sinclair) who was the great granddaughter of Lord Chief Justice Denman, trained at the Radcliffe Infirmary in Oxford. On the 1891 census she was listed as a Lady Nurse on the Isle of Wight 1. She married Charles Augustus Cobbold in Ontario, Canada. She volunteered for service with the Imperial Yeomanry Hospital and when accepted was taken into the Princess Christian’s Army Nursing Service (Reserve) 2. She served with the Imperial Yeomanry Hospital at Deelfontein 3. Her husband – Charles Augusts Cobbold served in WW1 with the Suffolk Regiment and died at Loos in 1915. It was not known if he served in South Africa. Dorothy Maud Chandler was born in Epsom on 2nd January 18861,2. She contracted Rheumatic Fever as a child which damaged her heart2. She trained as a nurse at the Epsom Union Workhouse Infirmary2,3, 1910-1914. She was accepted into the Queen Alexandra’s Imperial Military Nursing Service (Reserve) on the 14th January 19152. Most of her military service was at the Queen Alexandra Military Hospital, Millbank, London2. In April -May of 1917 she was sent on temporary duty to France. First to 26 General Hospital and then to 1 BRC Hospital to learn about a new way of dealing with wounds, the Carrel-Dakin method. 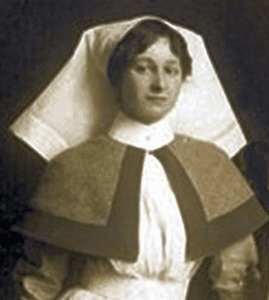 On 15th November 1917 she died of a cerebral embolism at the Hospital for QAIMNS Sisters, Vincent Square, London2. Her death was linked to a damaged mitral valve caused by Rheumatic Fever she had as a child2. Note: A prominent French surgeon, Dr. Alexis Carrel, was working in a temporary field hospital and lab near the forest of Compiegne in France, just six and a half miles from the front. Carrel realized that the greatest surgical need was a better method of sterilising wounds, so he and English chemist Henry D. Dakin developed a system that would irrigate wounds with a sterilising solution – saving soldiers’ lives and limbs. Dakin developed the solution, while Carrel developed an apparatus to deliver it.